A soulful, suspenseful sci-fi film that bends time and space, while challenging humanity to adopt a single, universal language that can transcend all borders and dimensions. 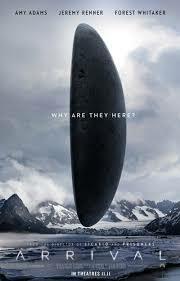 In the beautiful and enigmatic sci-fi thriller, Arrival, Amy Adams shines in a deeply emotional and nuanced performance as Dr. Louise Banks, a world renowned linguistics expert who is called upon by the U.S. military to attempt to make sense of the inexplicable arrival of 12 alien spacecraft which have ‘touched’ down in disparate parts of the Earth. She represents the necessity of a linguistic common denominator, believing that at the core of all civilization is and must be, Language. Bringing up the ranks in the Science category is celebrated physicist, Dr. Ian Donnelly, in a finely understated turn by Jeremy Renner. Together, these two must try to decipher who/what the aliens are, and more importantly identify what is their purpose for being here at this time. The looming question – across all nations of the world – is whether the arrivals mark an act of aggression against us or if these beings are essentially peaceful, in which case begging the deeper meaning of it all. The backdrop is a ticking time bomb as the arrivals have set mankind in an escalating state of agitation, with panic, paranoia and tribal/national enmities threatening to ignite a global conflict that will – in a domino effect – be the undoing of Humanity. The stakes couldn’t be higher, and for Louise Banks it becomes a deeply personal journey of memory, mourning and loss (over the death of her only child) which strangely informs her instincts as she tries to avert catastrophe and understand these mysterious visitors and why they are here. Director, Denis Villeneuve (Sicario; Prisoners), working from a smart script by Eric Heisserer, has made one of the most emotionally contemplative sci-fi films to come along in quite a while. The only other genre piece that comes close would be 2014’s heart rending Interstellar. And much of the emotional gravitas in Arrival must be placed squarely on the shoulders of Amy Adams, without whose quiet yet fervent presence in the role, the film would no doubt be a lesser creation. Which makes her Oscar snub last year that much more peculiar, and my choice of this relatively mainstream movie for Norma’s Streaming Picks a real no-brainer. The ending of Arrival is a real head-scratcher, admittedly. It’s mysterious, hopeful and sad all at the same time. And of course, Time itself is bent in strange and miraculous ways in this story. Which makes Louise Bank’s stream of consciousness dream state all the more enigmatic and symbolic. But perhaps the most palpable takeaway from Arrival is its message of the importance of collective, meaningful communication among nations. The film underscores the need for restraint and dialogue, especially in the face of nationalistic rhetoric and fear-mongering. We need to remember that we are ALL, as Louise Bank’s sign reads, HUMAN. Arrival is presently streaming on Amazon Prime.